It's time for one of our Tzinah Family artist to come back with a great EP. 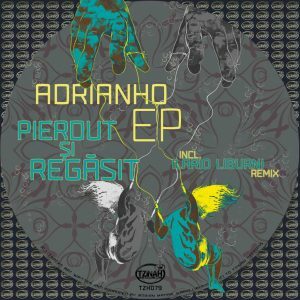 Adrianho gets lost and founds himself again in 'Pierdut și Regăsit EP'. Somewhere along the way he found Robson and had some really good back to back action in the track that gives the EP name. On the other two tracks Adrianho's groove and signature is imprinted, one with a very cool and eclectic rhythm and the other one goes very deep and smooth with fine touches of bits. Ilario Liburni is also back in action with a very housey approach and driving percussions on his layed back remix of 'Mai Mult Despre'. Another great chapter, 'Pierdut și Regăsit EP' by Adrianho and Ilario Liburni, from Tzinah with Love! Joseph Capriati: downloading for joseph capriati, thanks ! Mihai Popoviciu: nice one, will try! Andrew Grant: Ilario Liburni Remix is solid!!! Vygo: Nice ep! "Mai mult despre" wins! Andu Simion: Thanks for release; Mai Mult Despre - Original & Ilario Liburni Remix for me. Ilario Liburni: I had fun remixing Adrianho's track. Thnx Tzinah! Alex Kravitz: Big EP, thanks. Jozhy K: Nice original track. Ilario Liburni remix is my pick here! Gorbani: Great traxx, thanks for the music! M-Phunk: Very nice music from Adrianho ! Olivian Nour: Great release! Thanks for the music! Patrick Weblin: All tracks are great, each different, thanks! Andru: Nice ep. thanks ! Adam Touch: One of the best release this year! Liked the originals and nice job on the remix side too! Thanks for sending! Haydn: Super nice ep! full support !! Rods Novaes: Strong release! thanks! Ben Hoo: Peripetii is top for me, though all great thanks! Senoo: Thx for the music! Andrea Speed: Adrianho strikes again, love his music, and all the tracks on ep...thanks! Franco y Gael: very nice thank you !! Maertz: Really nice release, Mai Mult Despre is my pick, I will play for sure. Thanks so much.